Using the NASA/ESA Hubble Space Telescope, an international team of astronomers have mapped the mass within a galaxy cluster more precisely than ever before. Created using observations from Hubble’s Frontier Fields observing programme, the map shows the amount and distribution of mass within MCS J0416.1–2403, a massive galaxy cluster found to be 160 trillion times the mass of the Sun. The detail in this ‘mass map’ was made possible thanks to the unprecedented depth of data provided by new Hubble observations, and the cosmic phenomenon known as strong gravitational lensing. The team, led by Dr Mathilde Jauzac of Durham University in the UK and the Astrophysics & Cosmology Research Unit in South Africa, publish their results in the journal Monthly Notices of the Royal Astronomical Society. Measuring the amount and distribution of mass within distant objects in the Universe can be very difficult. A trick often used by astronomers is to explore the contents of large clusters of galaxies by studying the gravitational effects they have on the light from very distant objects beyond them. This is one of the main goals of Hubble’s Frontier Fields, an ambitious observing programme scanning six different galaxy clusters — including MCS J0416.1–2403. Astronomers using NASA’s Hubble Space Telescope have unexpectedly discovered the most distant cosmic magnifying glass, produced by a monster elliptical galaxy. Seen here as it looked 9.6 billion years ago, this monster elliptical galaxy breaks the previous record holder by 200 million years. These “lensing” galaxies are so massive that their gravity bends, magnifies, and distorts light from objects behind them, a phenomenon called gravitational lensing. The object behind the cosmic lens is a tiny spiral galaxy undergoing a rapid burst of star formation. Its light has taken 10.7 billion years to arrive here. Seeing this chance alignment at such a great distance from Earth is a rare find. 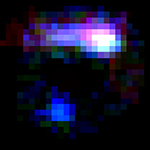 Locating more of these distant lensing galaxies will offer insight into how young galaxies in the early universe built themselves up into the massive dark-matter-dominated galaxies of today. Dark matter cannot be seen, but it accounts for the bulk of the universe’s matter. What looked at first like a sort of upside-down planet has instead revealed a new method for studying binary star systems, discovered by a University of Washington student astronomer. 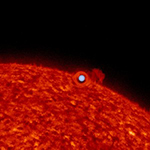 Working with UW astronomer Eric Agol, doctoral student Ethan Kruse has confirmed the first “self-lensing” binary star system — one in which the mass of the closer star can be measured by how powerfully it magnifies light from its more distant companion star. Though our sun stands alone, about 40 percent of similar stars are in binary (two-star) or multi-star systems, orbiting their companions in a gravitational dance. Kruse’s discovery confirms an astronomer’s prediction in 1973, based on stellar evolution models of the time, that such a system should be possible. A paper by Kruse and Agol was published in the April 18 edition of Science. Titan, Europa, Io and Phobos are just a few members of our solar system’s pantheon of moons. Are there are other moons out there, orbiting planets beyond our sun? NASA-funded researchers have spotted the first signs of an “exomoon,” and though they say it’s impossible to confirm its presence, the finding is a tantalizing first step toward locating others. The discovery was made by watching a chance encounter of objects in our galaxy, which can be witnessed only once. The international study is led by the joint Japan-New Zealand-American Microlensing Observations in Astrophysics (MOA) and the Probing Lensing Anomalies NETwork (PLANET) programs, using telescopes in New Zealand and Tasmania. Their technique, called gravitational microlensing, takes advantage of chance alignments between stars. When a foreground star passes between us and a more distant star, the closer star can act like a magnifying glass to focus and brighten the light of the more distant one. These brightening events usually last about a month. NASA’s Hubble Space Telescope has weighed the largest known galaxy cluster in the distant universe, catalogued as ACT-CL J0102-4915, and found it definitely lives up to its nickname — El Gordo (Spanish for “the fat one”).